Dr. Kilin's current research interests are focused on modeling the photo-induced dynamic processes of charge transfer, nonradiative charge carrier relaxation, and surface reactions at catalytic sites and interfaces of metal and semiconductor nanomaterials for photovoltaic and photocatalytic solar energy conversion. T. Vazhappilly, D. S. Kilin, D. A. Micha, Modeling the surface photovoltage of silicon slabs with varying thickness, Journal of Physics: Condensed Matter, 2015, 27(13) 134204. Stephanie Jensen and Dmitri S Kilin, Electronic properties of nickel-doped TiO2 anatase, Journal of Physics: Condensed Matter 2015, 27 (13) 134207. 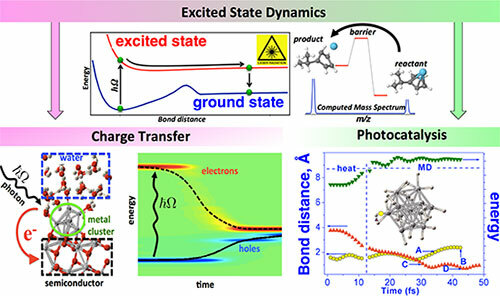 Dayton J. Vogel and Dmitri S. Kilin, Electron dynamics of solvated titanium hydroxide, 2015, 113 (3-4) 397-407; DOI:10.1080/00268976.2014.999837. Q. Meng, J. Chen, D. Kilin, Proton reduction at surface of transition metal nano catalysts, Molecular Simulation, 2015, 41 (1-3) 134-145; DOI:10.1080/08927022.2014.911871.